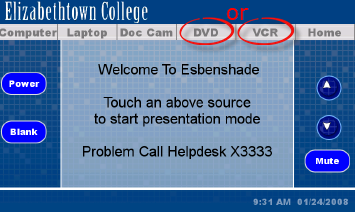 Technology Instructions for Esbenshade 362 and 373. If you experience any problems, call ext. 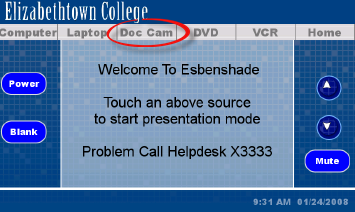 3333 or e-mail the Help Desk at mediaservices@etown.edu. Please visit our Web site at http://www.etown.edu/ITS for additional information. Step 1:You will need a key from OT or ITS to unlock the drawer. When you have unlocked it, Get the laptop out of the drawer in the cabinet. Make sure to get the laptop cables from the drawer too. 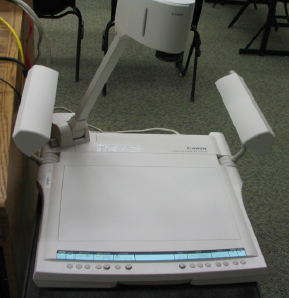 Turn on the Document Camera. The power switch is on the left side. The panel lights will turn green when turned on. Step 2:Press anywhere on the AMX Touch Panel to turn on the Panel screen. Step 4:Raise the camera arm using the release at the bottom of the arm. Lift the side arms. Step 5:Press the Light button to turn on lights for the doc cam. Use the buttons to adjust the view of your objects. Step 1:You will need a key from OT or ITS to unlock the drawer. Get out the laptop from the drawer in the cabinet. Also get the laptop cables from the drawer. 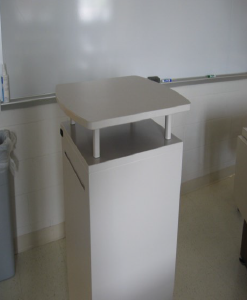 Step 2:Put the laptop on the podium stand. Step 3:Begin with the laptop turned off in order to connect. 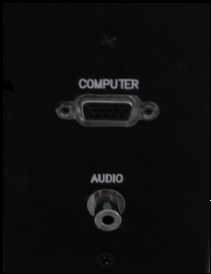 Step 4:Connect the VGA and audio cables to the computer and audio ports located on the wall. Step 5:Connect the Ethernet cable to the orange network jack on the wall. Step 6:Press anywhere on the AMX Touch Panel to turn on the panel screen. Step 7:Touch the LAPTOP button on the touch screen. When you touch the Laptop option, the projector will automatically turn on. 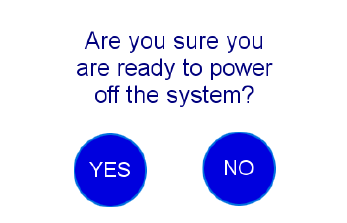 Step 8:Turn on the laptop by pressing its power button. If you need power, plug your power adapter into the wall outlet. 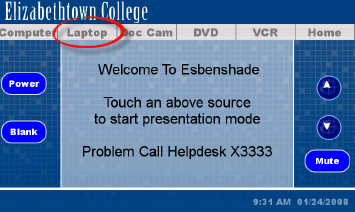 Step 9:Press the appropriate keyboard combination to display the laptop image on the projection screen. Warning: Laptop resets upon restart and shut down. Save your files to the network or removable media only.